We're in Coeur d'Alene, ID and I knew we would be out and about for lunch today so I went to the website Roadfood.com to see what might be in the area. Yes, I have it bookmarked - We're retired, remember!! 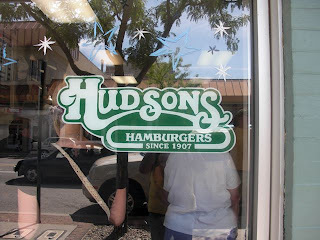 Hudsons Hamburgers - been making them since 1907 and they have perfected simple meat, pickle, onion, and sauce in a bun. No fries, no shakes, no lettuce, just hamburgers AND pie! This place is a long narrow room with a counter and maybe fifteen bar stools. We got there just before noon and had to wait a few minutes for someone to FINALLY finish and get gone so we could feed ourselves!! It was good though because we had a seat right in front of the grill. 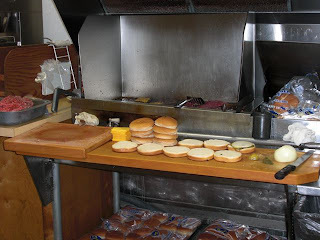 The cook was forming those patties as he slapped 'em on the grill. By the time we were finished eating the line was out the door a ways! I don't know why I can't remember to take pictures of food before I start to eat! No way you're going to see a picture of that piece of pie that JC and I shared! That's right folks - the hamburger was just over $2. It was really good, too! They also make a breakfast ham and egg sandwich, but they stopped serving those at 11:00. It's amazing that something as simple as a good fried hamburger has people waiting in line out the door. Good food at bargain prices. You can't beat a hamburger done right. Good blog and pics! At least tell us what kind of pie!! 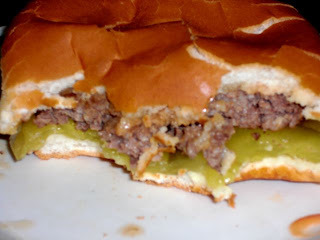 i'm a friend of crystal's in Greenville - she sent me your link b/c i am going to be in cda next yr - please post "reviews" on any of the places you visit - it would be much appreciated - also, would love to know where you stay and what you might recommend - will def stop for a burger - i love all those pickles - and yes, i also want to know WHAT KIND OF PIE???? We did eat at the Cedars Floating Restaurant just down from the Blackwell Island RV park where we are staying (very nice). The food was good, but pricey. Unfortunately, we are here for a short time, so I won't have anything else to recommend first hand, but Roadfood.com also suggested a steakhouse a few miles outside of town called Wolf Lodge Steakhouse. 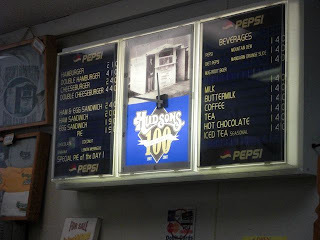 We had lemon pie at Hudsons, but there were several choices! Good luck on your ironman! thanks - will look up roadfood too. And Lemon is one of my favorites - so I'll be sure to save room for pie!